New Officers, Board Installed - Delegates wrapped up business Thursday morning with the installation of the 2008-2011 churchwide executive board. The newly elected officers include: Beth G. Wrenn (Kill Devil Hills, North Carolina, 9B) president; Charlene Spillmann (Kyle, Texas, 4E) vice president; Betty Brandt (Grand Rapids, Minnesota, 3E) secretary, and Anjanette B. Hodges (Christiansburg, Virginia, 9A) treasurer. 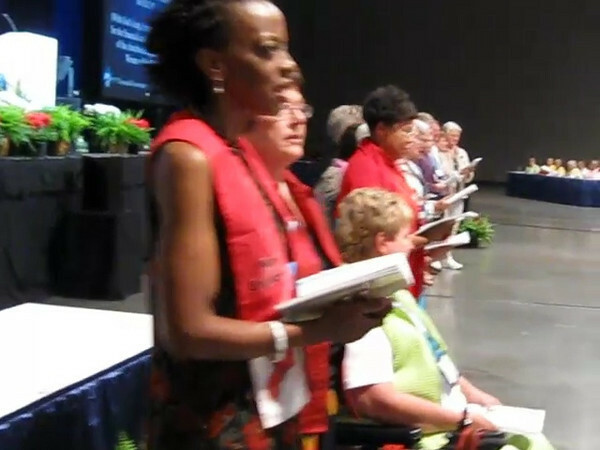 Elected to second terms on the churchwide executive board were Diane L. Brauer (Lincoln, Neb., 4A); The Rev. Rosalind M. Brathwaite (Astoria, N.Y., 7C); Cam Martin (Minocqua, Wisconsin, 5G); and Marie A. Tesch (Waseca, Minnesota, 3I). New board members include vEnessa Acham (Lebanon, New Hampshire, 7B); Marlene J. Bergum (De Pere, Wisconsin, 5J); Kristine E. Brugamyer (Dickinson, North Dakota, 3A); Marjorie Dykstra (Akron, Iowa, 5E); Diane J. Frederick (Oak Park Heights, Minnesota, 3H); Jo Ann Fuchs (West Columbia, Texas, 4F); Sandra S. Lange (Choteau, Montana, 1F); Glynis Reid-Megargel (Old Bridge, New Jersey, 7A); Jennifer S. Michael (9E); Vickie L. Murph (Columbus, Ohio, 6F); Phyllis Rude (Anchorage, Alaska, 1A); Charleen Walker-Horton (York, Pennsylvania, 8F); Sharon Heck (Whittier, California, 2B).